Shi'a Muslims mak their wey tae the Imam Husayn Mosque in Karbala, Iraq in 2008. 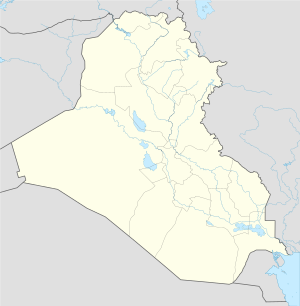 Karbala (Arabic: كربلاء‎; BGN: Al-Karbalā’; an aa referred tae as Karbalā' al-Muqaddasah) is a ceety in Iraq, locatit aboot 100 km (62 mi) soothwast o Baghdad. Karbala is the caipital o Karbala Province, an haes an estimatit population o 572,300 fowk (2003). The ceety, best kent as the location o the Battle o Karbala (680), is amangst the holiest ceeties for Shia Muslims efter Mecca an Medina. It is hame tae the Imam Hussein Shrine. Karbala is famous as the steid o the martyrdom o Hussein ibn Ali (Imam Hussein), an commemorations are held bi millions o Shias annually tae remember it. Karbala is considered saucrit bi baith Shias an Sunni muslims. Wikimedia Commons haes media relatit tae Karbala.